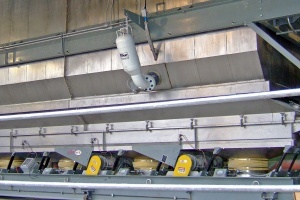 Vibrating fluid bed dryers and coolers from process equipment manufacturer The Witte Company (Washington, New Jersey) are available with an optional, high-pressure design to accommodate the addition of third-party, automated explosion suppression systems. Offered upon customer request, the sealed design features reinforced 12-guage steel throughout plus 25% more clamps than on standard designs to handle the rapid pressure increase that occurs when an explosion suppression system is triggered. Covers, pans and panels remain safely intact. The fluid bed coolers and dryers are specified when drying food, chemical, pharmaceutical, mineral and other products that may generate combustible, fine particles and airborne dust. Sugar, corn starch, clay, aluminum and fertilizer are among the products that may present a hazard.